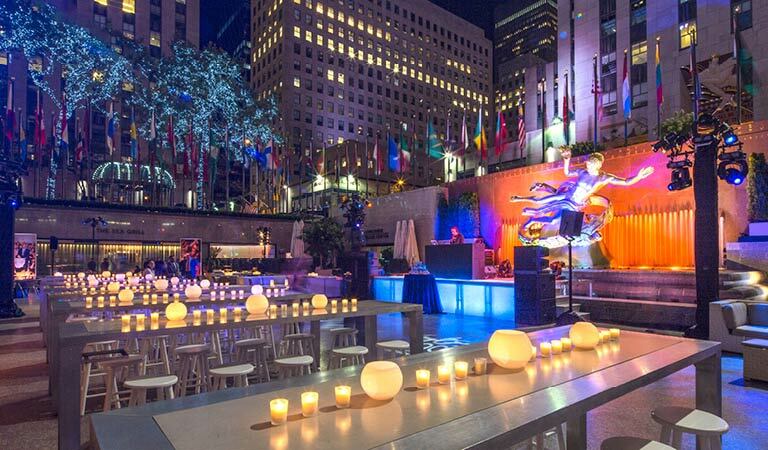 Whether it is an elegant multi-course dinner for ten or a large gala reception for 2,000, our unique event venues at Rockefeller Center are the perfect, iconic New York City location for your corporate event or private party. The accomplished chefs of our award-winning restaurant group create custom menus for each event. Our clients receive incomparable personalized attention from our events team, who has decades of experience at our landmark location. We have event spaces to rent for parties year-round, with access to the world’s most famous ice skating rink in the winter, and midtown’s largest outdoor event space in the summer. Inquire with us today to start planning your private event at the best event space in midtown! With over 7,000 square feet indoors and 7,200 square feet of outdoor space, we have a unique opportunity to host impressive, large events for up to 2,000 guests in midtown Manhattan. Our elegant dining room, designed by world-famous restaurant designer Adam Tihany, offers impressive views overlooking The Rink in the winter and our lush, flowering Summer Garden in warmer months. Rock Center Café offers a classic New York City ambiance, with a series of original prints by Andy Warhol and stunning views of the gilded Prometheus statue, overlooking The Rink from October – April, and our Summer Garden & Bar from May – September. Open May – September, this rare oasis in the middle of Midtown has 7,200 square feet of outdoor event space and endlessly flexible floorplans. There’s no better place to host summer cocktail parties, corporate celebrations, gala receptions – or a barbecue party for 400 of your closest friends. This beloved New York City landmark has been a quintessential Manhattan experience for over 80 years. During the holidays, Rockefeller Center’s Christmas tree creates a truly festive atmosphere. Add skating to your event to guarantee an unforgettable party, or carpet the ice and transform the space into a winter wonderland.